The only tub I spend any amount of time in is the hot tub. Otherwise, I am a shower-loving girl. However, I know that for some of you, the "soak" is a sacred, coveted time filled with ritual and scents and possibly even candles and music. This over-the-top Geekmas gift idea is for you (and the Rich Kids of Instagram, naturally). This, my geeks, is an audiophile's tub. Or a tub for anyone who enjoys a long luxurious soak accompanied by tunes. And who has a bottomless wallet. 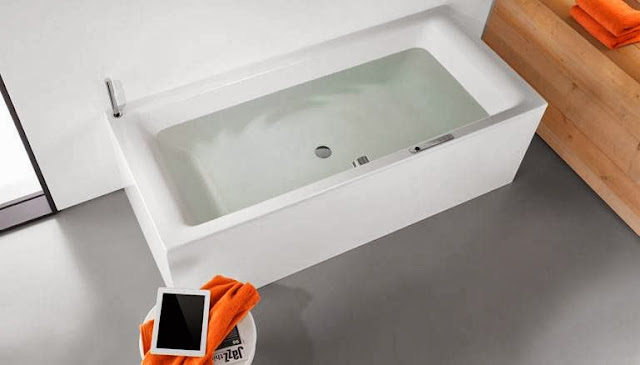 Kaldewei Sound Wave System for baths turns your tub into a bluetooth speaker that you soak in: you install sensors all around the tub and a bluetooth receiver for connectivity (which also keeps you safe). Then connect any Bluetooth device to listen to tunes through your tub and water. That's right, perfect sound coming from the tub and even under water. Personally, I love that you have to enter a password to connect, since you really don't want the kids hijacking your connection and blasting some death metal during your downtime. Unless you're into that sort of thing.